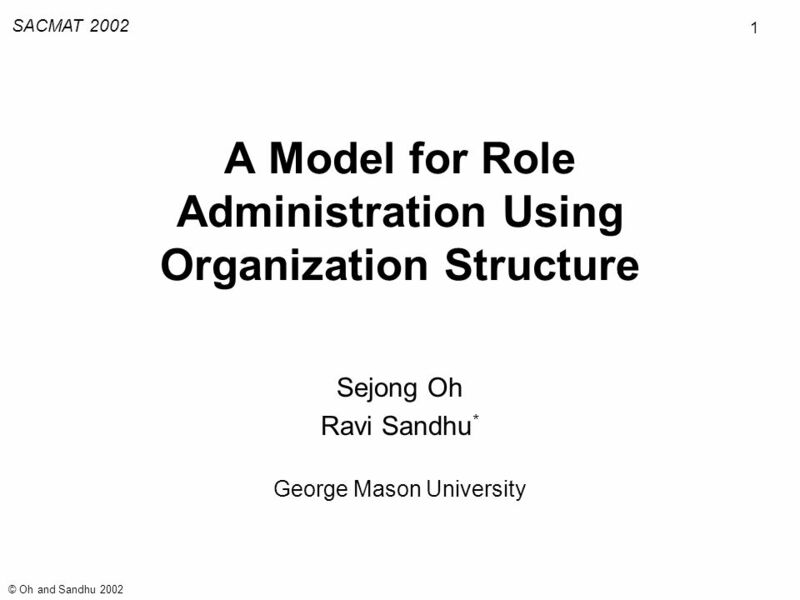 1 SACMAT 2002 © Oh and Sandhu 2002 A Model for Role Administration Using Organization Structure Sejong Oh Ravi Sandhu * George Mason University. 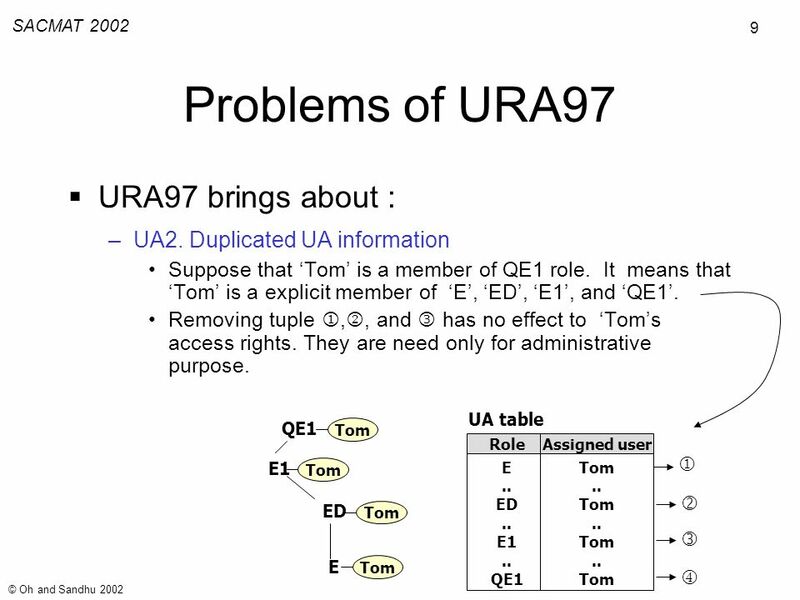 8 8 SACMAT 2002 © Oh and Sandhu 2002 Problems of URA97 URA97 brings about : –UA1. Multi step assign Suppose that new employed engineer John will be assigned to QE1 role. 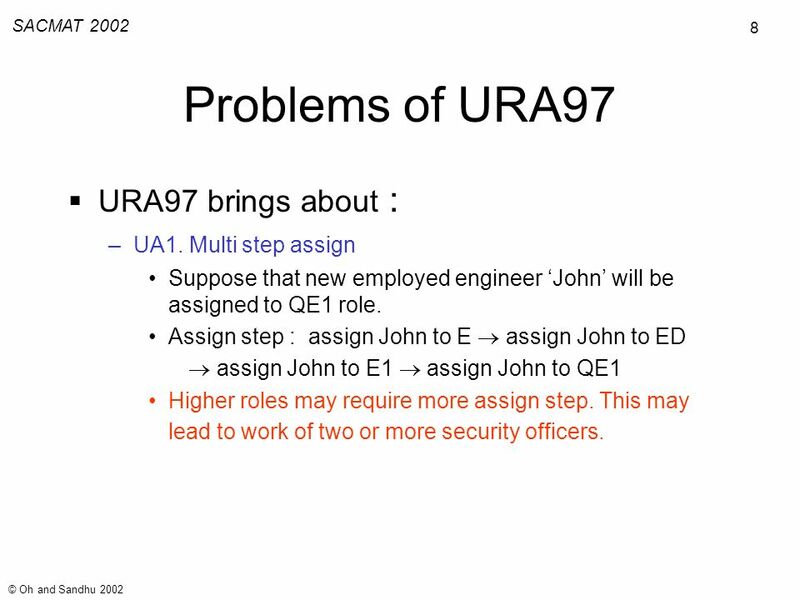 Assign step : assign John to E assign John to ED assign John to E1 assign John to QE1 Higher roles may require more assign step. This may lead to work of two or more security officers. 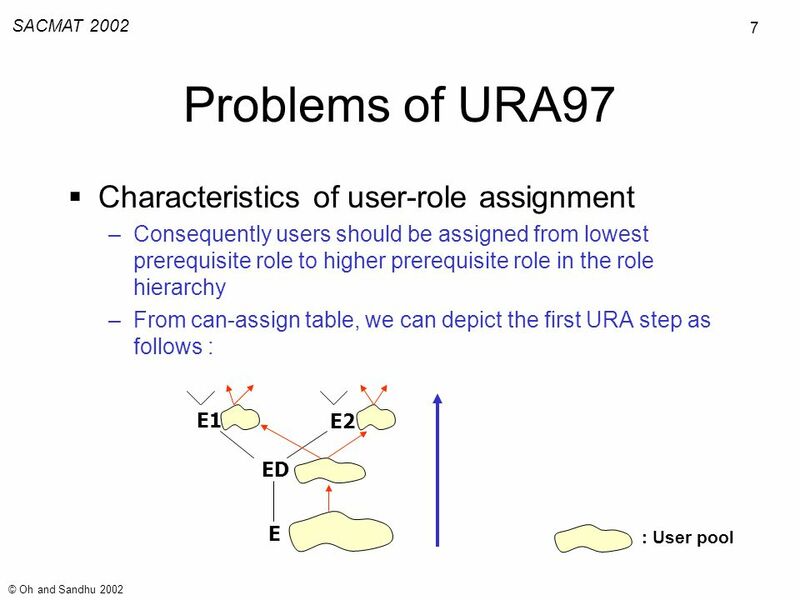 10 10 SACMAT 2002 © Oh and Sandhu 2002 Problems of URA97 URA97 brings about : –UA3. 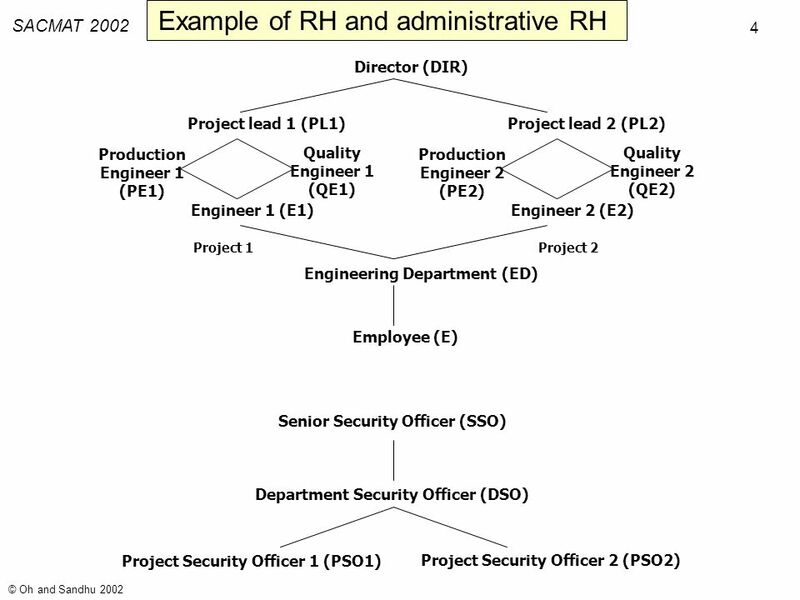 Restricted user pool Suppose the company in the example wants to maintain human resource pool H1, H2, and H3. And new policy requires that Production Engineer should be picked from H1 and Quality Engineer should be picked from H2. It is impossible to realize new policy without changing the Role Hierarchy. 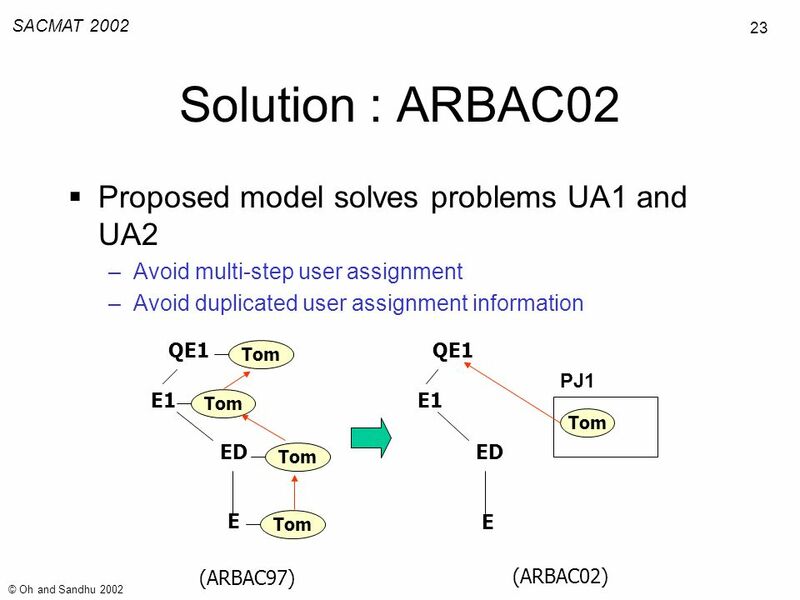 24 24 SACMAT 2002 © Oh and Sandhu 2002 Solution : ARBAC02 Proposed model solves problems UA3 –Suppose the company in the example want to maintain human resource pool H1, H2, and H3. And new policy requires that Production Engineer should be picked from H1 and Quality Engineer should be picked from H2. –In the proposed model, new org. Unit H1, H2, and H3 can be added at proper positions in org. structure. 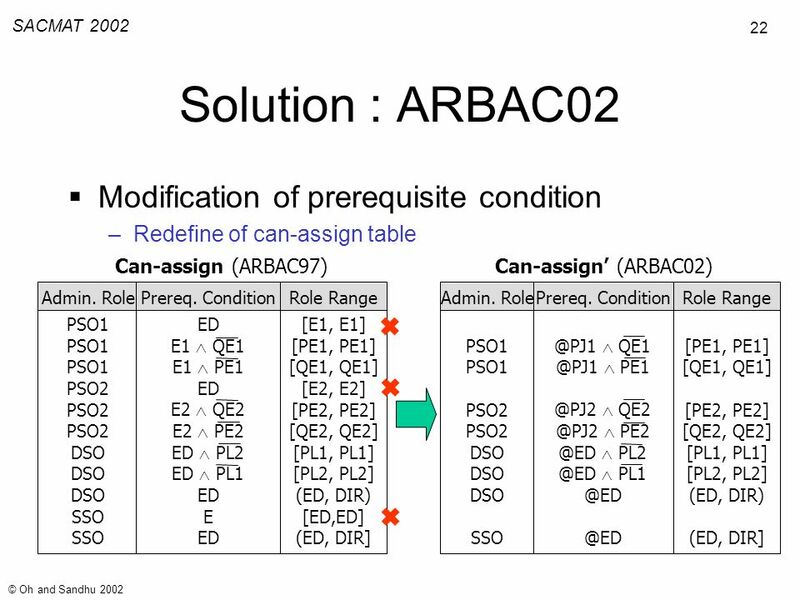 Then change prerequisite condition such like : can-assign(PSO1, PJ1 QE1, [PE1, PE1]) can-assign(PSO1, @H1, [PE1, PE1]) –Requires no change of role hierarchy ! 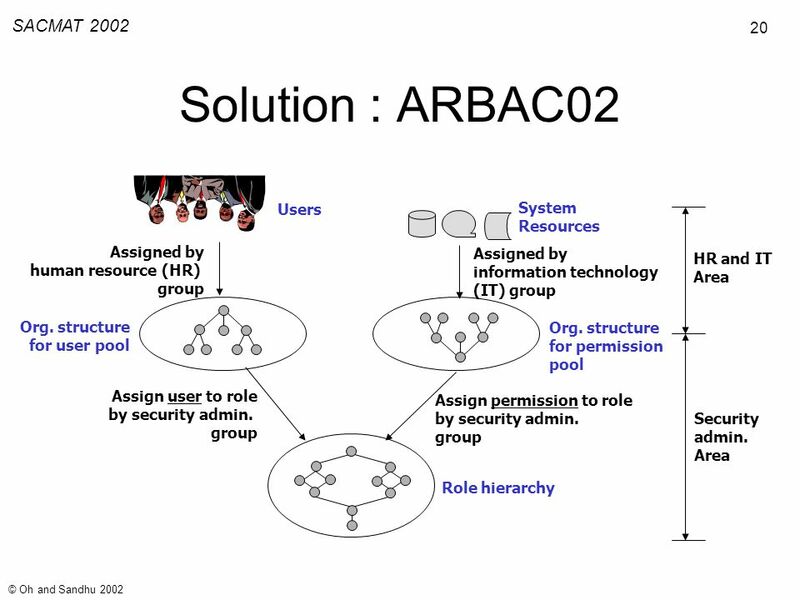 27 27 SACMAT 2002 © Oh and Sandhu 2002 Conclusion ARBAC02 overcomes shortcomings of ARBAC97 ARBAC02 supports flexible user pool and permission pool structure independent from role hierarchy. 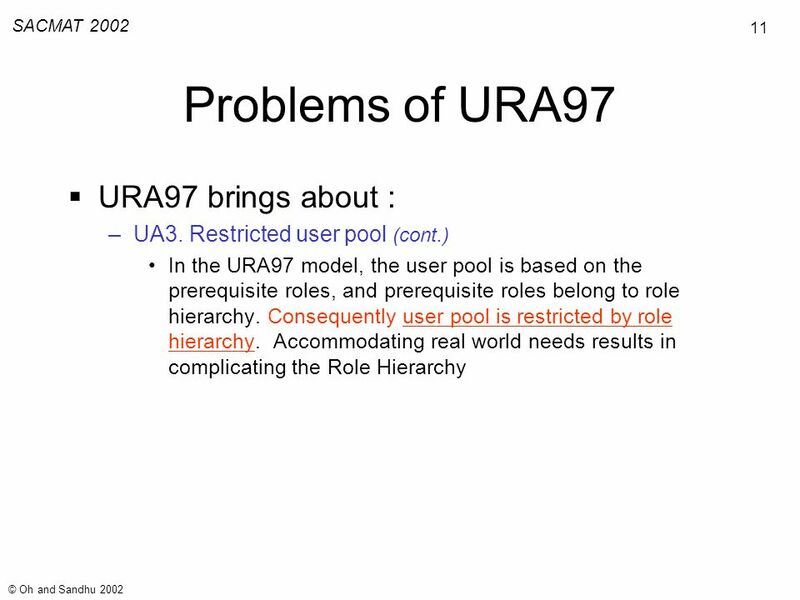 –In the ARBAC97 model, user pool and permission pool are tightly coupled with role hierarchy. This leads to various problems. 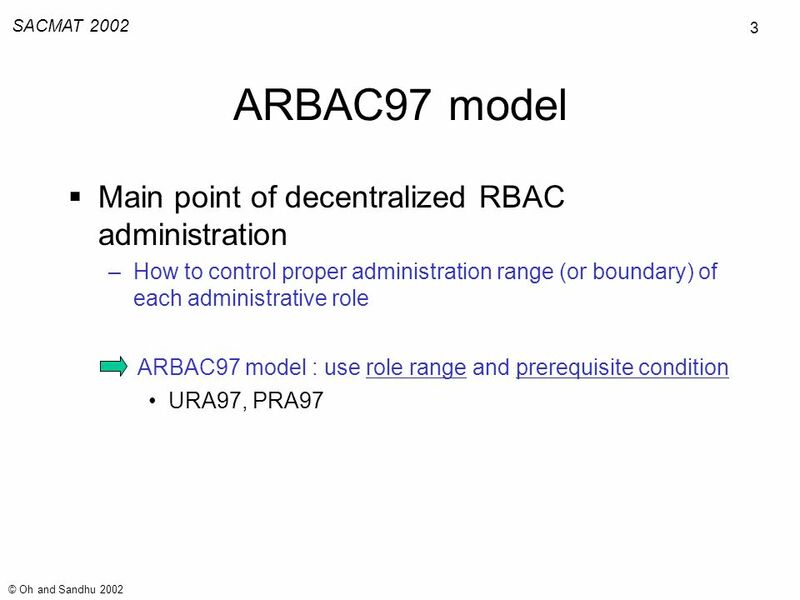 ARBAC02 supports bottom-up oriented permission- role assignment –PRA97 model follows top-down approach. It leads to undesirable permission flow. 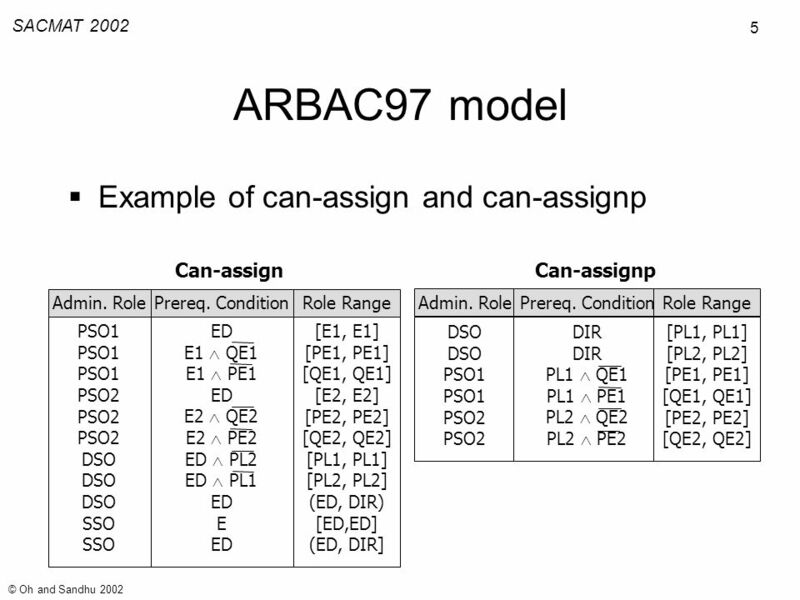 Download ppt "1 SACMAT 2002 © Oh and Sandhu 2002 A Model for Role Administration Using Organization Structure Sejong Oh Ravi Sandhu * George Mason University." Role-Based Access Control Prof. Ravi Sandhu George Mason University and NSD Security SACMAT 2003. Role Activation Hierarchies Ravi Sandhu George Mason University. ACCESS CONTROL: THE NEGLECTED FRONTIER Ravi Sandhu George Mason University. ENGINEERING AUTHORITY AND TRUST IN CYBERSPACE: A ROLE-BASED APPROACH Prof. Ravi Sandhu Laboratory for Information Security Technology George Mason University. 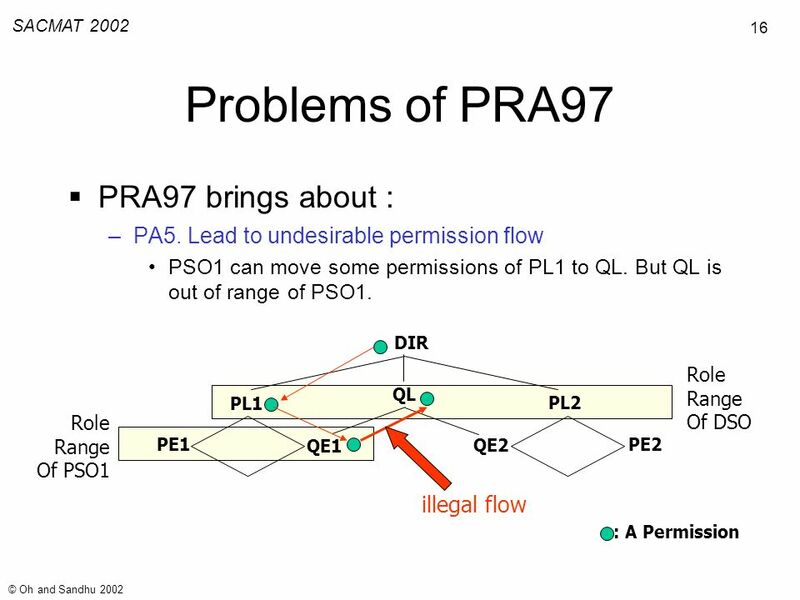 An ORACLE Implementation of the PRA97 Model for Permission-Role Assignment Ravi Sandhu Venkata Bhamidipati George Mason University.